Large format print aka wide format print includes posters, vinyl banners, banners with eyelets and bungees, double-sided banners, fabric banners, tablecloths and backdrops for stages. 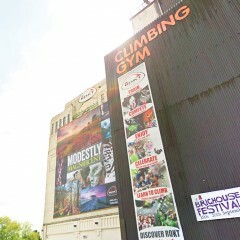 Also graphics for buildings – wall graphics, floor graphics, window graphics and giant building wraps. 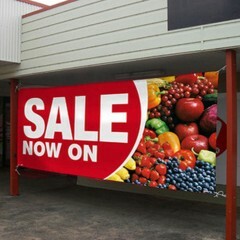 Heavy-duty wall graphics and floor graphics for supermarkets, malls, gyms etc. 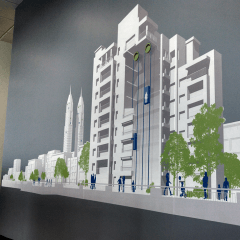 Fresco large format printing not only makes the graphics on our range of portable displays possible, it also allows you to put fantastic images on windows, walls, floors, railings etc. And it does not stop there. 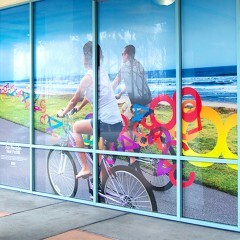 Building wraps are giant wind-permeable, bungee-mounted banners that really get attention. With over 25 years experience, Fresco knows a lot about exhibitions, large format print and building graphics. This means that all our products are backed up by helpful, expert support. 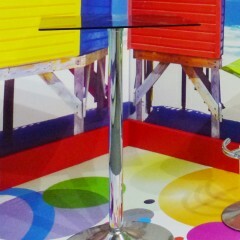 All Fresco’s large format print is produced in the UK. Fresco uses special media with, for instance, non-slip guarantees so that we can assure you that your graphics will stay the course. 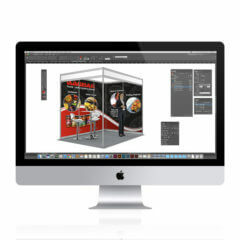 Fresco provides a full on site installations service for all the many types of graphics we produce. Send us artwork for your print or use our design service. Alternatively you could send us resources (logos and so on) and we will artwork them for you. This can be a very cost-effective option. Whatever suits you, you will find Fresco responsive. Our studio staff are helpful, expert and a pleasure to work with. They offer free technical support for your own designers. This will help them to produce perfect print. It helps us and it helps you. Fresco also goes the extra mile to make sure your graphics get delivered on time, every time.